Andres Manuel Lopez Obrador is poised to win Mexico's presidency. He's promised Mexicans a new country — can he deliver? The Left is about to win in Mexico. Attacks are recycled from previous elections: AMLO’s old age (though he’s only sixty-four), the specter of a Venezuela-style debacle, a “return” to the failed protectionist strategies of the 1970s’ Institutional Revolutionary Party (PRI), the then- and now-ruling party. The country’s comentocracia — the recurring cast of television pundits and opinion columnists — traffics in hyperbole, stoking fears of an authoritarian populist government. AMLO, running under the banner of his recently minted party Movimiento de Regeneración Nacional (MORENA), is pitted in a four-way race. He faces Ricardo Anaya, a self-styled neoliberal wunderkind heading a coalition between the scraps of the historic center-right and center-left parties (the National Action Party [PAN] and the Party of the Democratic Revolution [PRD]) and currently under investigation for money laundering; Jose Antonio Meade, the current PRI regime’s bureaucrat, running on a claim of technocratic “expertise;” and Jaime Rodriguez Calderon, who stepped down as governor of the large state of Nuevo Leon to run a haphazard independent campaign as the folksy “outsider” whose main contribution to the electoral cycle so far has been his proposal to chop off the hands of corrupt office holders. Lopez Obrador has come very close to winning before. In 2006 he lost by less than 1 percent of the vote in an election marred by irregularities (although it was never clear how systematic these were). In 2012, he lost by a larger percentage (6 percent), in an election with well-documented vote-buying tactics deployed by the PRI’s victorious Peña Nieto. AMLO has been in the national spotlight since 2000 when he became mayor of Mexico City. What explains his astronomical success now? The country’s current state seems to confirm the critique AMLO laid out during his first run twelve years ago. The exiting Peña Nieto government presided over anemic economic growth that left poverty levels — which hover around 50 percent — basically untouched. The death toll of the drug war, already in the hundreds of thousands, grew to a historic peak last year. High-profile corruption cases have plagued the PRI administration. Much touted free market reforms like opening the state-owned oil company PEMEX to private investment and an “educational reform” aimed at weakening teachers’ unions — have yielded meek results. But the PRI is not the only major political party to have entered the electoral cycle in disarray. The PAN, which governed the country between 2000-2012, devolved into a “pocket opposition” during the Peña Nieto presidency, supporting most of his proposed major reforms en bloc. In addition, when the time to choose a candidate for the upcoming presidential race heated up, Anaya, then the president of the party, strong-armed his way into the nomination, alienating an entire wing of the party committed to the candidacy of Margarita Zavala, wife of ex-president Felipe Calderon. Zavala split and made a short-lived run as an independent, eventually bowing out of the race as her numbers remained in the single digits. The party went on to sign a “Pact for Mexico,” pledging to focus on shared political goals with Peña Nieto’s presidency. This marked the start of an erosion of its identity as a leftist opposition party and condemned any attempts to pivot to an anti-establishment message later. The PAN-PRD coalition for this election has been a flop. 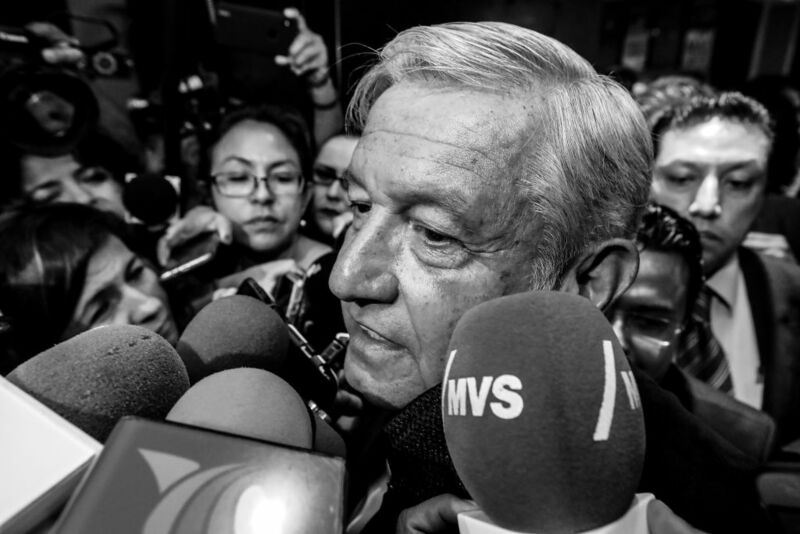 AMLO’s success, however, has come with questionable political alliances. A wide cast of old adversaries have now bizarrely changed their minds. Many outright opportunists have come to the party’s shores, abandoning sinking ships. Pragmatism has tested principles more than once, most clearly in MORENA’s alliance with the conservative evangelically inspired Partido Encuentro Social. AMLO has accepted everyone with little-to-no gatekeeping. This is not entirely surprising from someone who at a young age was himself a member of the PRI (he was later part of the party’s left wing that splintered in the late 1980s). It is not hard to see in these alliances the seeds of scandals and troubles to come. This vision limits a more robust leftist agenda. His detractors on the Right see in this constant berating of the mafia del poder a dangerous tactic of social polarization. They miss, however, that the concept ultimately rests on the principle that interests between lower and higher classes are not fundamentally at odds and can be harmonized. For every member of the mafia in AMLO’s script, there is a “socially oriented businessmen.” Here, the far left is right to suspect that MORENA will in fact be a Trojan horse for renewing an upper class currently lacking moral authority and political legitimacy. Few of AMLO’S supporters are voting naively. As one activist’s banner reads, humorously paraphrasing a famous song, “He is not perfect, but he is close to what I have simply dreamed.” Yet as AMLO’s expected victory nears, a popular effervescence breaks through the surface in the large rallies he holds through out the country. If only because the country’s ills run so deeply, a Lopez Obrador presidency does have, after all, the potential to lift millions out of poverty, rebuild a tarnished nation, and expand the horizons of acceptable political demands. The Left is about to win in Mexico, thanks to voters’ bet on the possibility — not the certainty — of a new country. Author has no relation to MORENA campaign surrogate John Ackerman.